'One of the most successful exploring naturalists that have ever lived', Robert Swinhoe resided at Takao in the 1860s. Swinhoe's prolific studies of wildlife established his position not only as the instigator of the scientific study of the Taiwan's birds but also as a major contributor to the theory of evolution proposed by Darwin and Wallace. Robert Swinhoe lived a brief but highly noteworthy life, particularly in Formosa (Taiwan), during the heyday of the British Empire in the 19th century. Born in Calcutta on 1 September 1836, Swinhoe was educated in England and arrived in South China in 1854, when he was only 18 years old. Robert Swinhoe spent the next 21 years on the South China coast and the island of Formosa. After suffering a stroke in China in 1875, he returned to London for two brief years, during which he was elected a Member of the Royal Society. He was just 41 years of age when he died in 1877. His extensive work studying the ornithology of Formosa has seen him recognised as the founder of all scientific work on the island. Not only did he document a vast number birds, butterflies, moths and mammals, he was also the instigator of the Formosan tea trade to Britain, and Taiwan's first foreign resident diplomat. 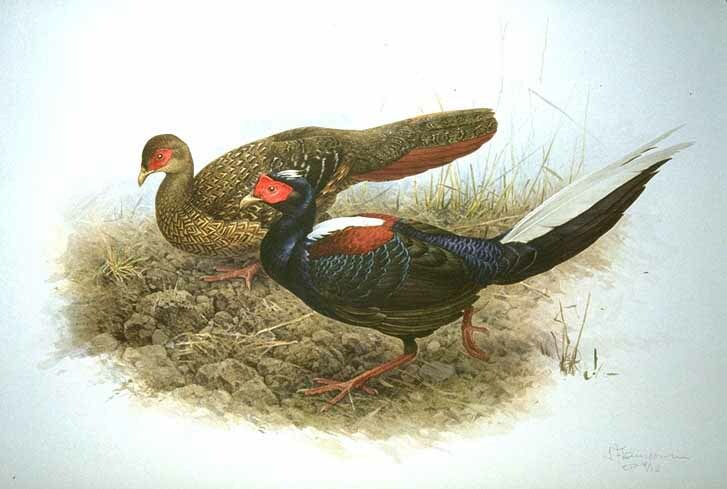 Discovered by Swinhoe and named in his honour by Gould, Swinhoe's Pheasant (Lophura swinhoii ) was once considered the most beautiful bird in the world, as can be seen in this superb contemporary illustration by J Fenwick Lansdowne from the 'Rare Birds of China' portfolio (courtesy Clodius Corporation). Robert Swinhoe was born in Calcutta, India, on 1 September 1836, and, returning to England for his education, entered King's College, London in 1853. However in Swinhoe's first year of university, still just 18 years old, he was recruited into the China consular corps by the the British Foreign & Colonial Office and sent to the new colony of Hong Kong as a temporary interpreter in the British Foreign Service. In 1855 he was transferred to the British Consulate at Amoy and subsequently promoted to Second Assistant in 1856. Whilst in Amoy (Xiamen) he founded the short-lived but active Scientific Society of Amoy, presenting an important paper on the zoology of the area. This first scientific paper published by Swinhoe - 'Remarks on the Fauna of Amoy' - appeared in the 1858 edition of 'The Zoologist'. In March 1856 he crossed the Taiwan Strait to the island of Formosa, where he spent two weeks at Hsiang Shan (Heongsan), Hsinchu, to make observations and to collect specimens. This trip, and the resultant observations on the flora and fauna, is considered to be the start of scientific collections made on the island. However, it should be noted that a William Stimpson, a scientist on a US Navy ship that had visited Formosa on 25 September 1854, has a prior, if discounted, claim. Swinhoe's second trip to Formosa was made as interpreter aboard the British warship HMS Inflexible which arrived at today's Budai, Chia-yi County, on 8 June 1858. The object of this expedition was to search for two British citizens, Messrs Smith and Nye, who were believed to have been kidnapped by aborigines. The ship continued down the coast, putting in at An-ping (Tainan) on 11 June, Takao (Kaohsiung) on 12 June, Fang-liao on 14 June, before rounding the southern cape of Formosa to arrive at Su-ao on 18 June and Keelung on 20 June, where the party spent several days inland in an abortive search for Mr Nye. Passing up the east coast and down again to Tainan via Tamsui, the ship completed a circumnavigation of the island. In the course of this trip Swinhoe was able to collect a formidable number of animal and plant specimens. The trip has been recorded by one of the party, William Blakeney, and was published as an essay entitled 'At the Pratas Reef and on the Eastern Shore of Formosa' in 'On the Coasts of Cathay and Cipango Forty Years Ago' published by Elliot Stock in 1902, and from which the following engraving is taken. 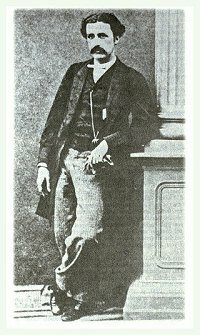 On 12 December 1860 Robert Swinhoe, aged 24, was appointed as the first British Vice-Consul to Formosa. He arrived the same month on board HMS Inflexible in north Taiwan at Keelung where he had been sent to investigate the extent of coal deposits in the vicinity and to explore the possibility of using Keelung as a coaling station for British ships. He returned to Amoy in January 1861. In June 1861 Vice-Consul Robert Swinhoe arrived in Takow (Takao, Kaohsiung) on board HMS Cockchafer and travelled overland from Takow up to Taiwan-fu (Tainan). At this time, Swinhoe documented the Formosan Rock Monkey (Macaca cyclopis) which is still found today in great numbers on Ape Hill (Takao Hill) in Kaohsiung. For a recent article about these monkeys on Takao Hill, please click here. In Tainan, Swinhoe succeeded in opening the British Consulate on 10 July 1861. 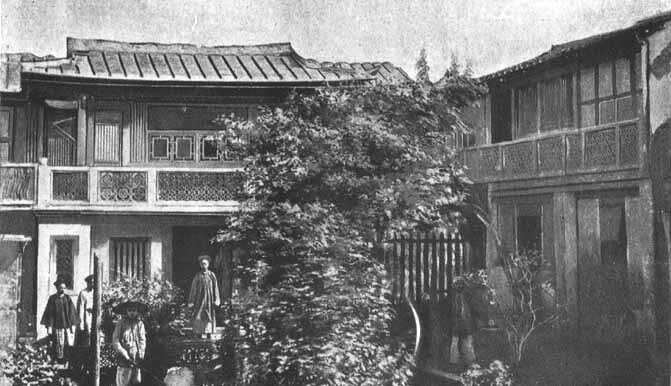 This consulate was photographed by William A Pickering and published in his illuminating book 'Pioneering in Formosa : Recollections of Adventures among Mandarins, Wreckers, & Head-hunting Savages' (Hurst and Blackett Ltd, London, 1898; reprinted by SMC Publishing Inc, Taipei, 1993). The illustration is shown below. Swinhoe moved the consulate to Tamsui in late 1861, where there was more prospect of trade. At that time he stayed aboard Jardine Matheson's SS Adventure, moored at the mouth of the Tamsui River, which served as the British Consulate before the old Spanish fort of San Domingo was leased from the Ching Government in 1862. Although he stayed in Tamsui less than a year, he managed to arguably instigate the tea trade between Formosa and Britain by sending back a sample of Mucha tea for testing. Consequent to this, the British merchant John Dodd promoted the development of the tea industry in Taiwan through the cultivation of tea bushes in the Wen-shan District. Despite making a successful expedition up the Tamsui River in March 1862, a weakened Swinhoe was obliged to temporarily return to London in May 1862, where he was elected a Fellow of the Zoological Society in recognition of his pre-eminence in this field. In October 1863, following the establishment of the Chinese Imperial Maritime Customs under Sir Robert Hart, permission was granted by the Ching Court to open a Maritime Customs house in Takow at Shao-chuan-tou, where the old British Consulate now stands and which was designated as the foreign residents' area. The Customs House was set up in Takow in May 1864, and Swinhoe, having returned to Tamsui in February 1864, was sent down to Takao in August 1864 to establish a British Consulate. 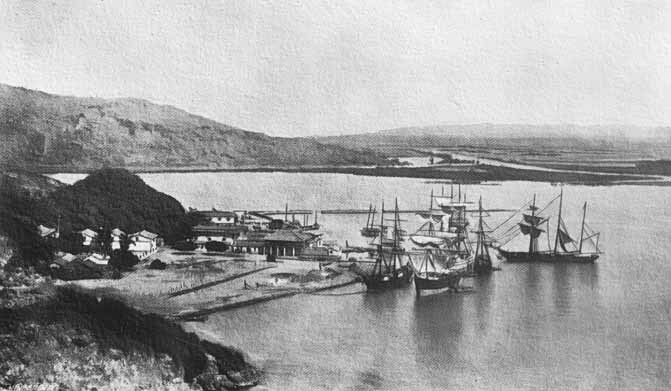 The photograph below, again from Pickering's book and taken around 1865 from Saracen's Head on Chi-chin island, shows the area known as Shao-chuan-tou, now part of Hamasen, Ku-shan District, Kaohsiung, rising to the left is Ape's Hill and in the centre can be seen today's Love River. It is possible that one of the ships shown in the photograph is either the 'S S Clover' or Dent & Co's opium receiving ship, 'Ternate', an old Dutch frigate. Both of these ships have been reported as Swinhoe's home during the main period that he resided in Takao, from September 1864 to February 1866. 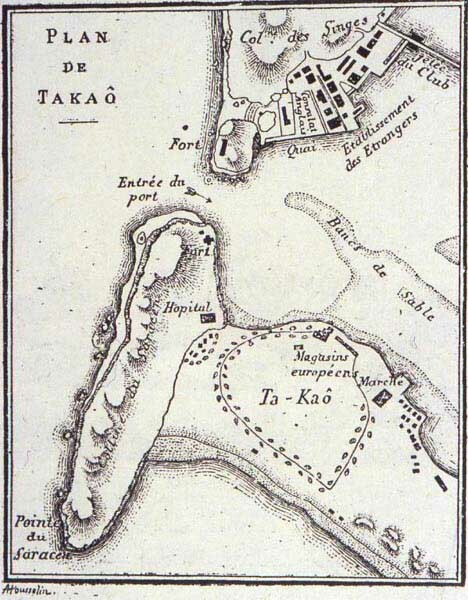 At that time 'Takow' was located on Chi-chin island, in the area now known as Chi-hou, as shown on the map below from C Imbault-Huart's 'L'ile Formose, histoire et description'. Note that British (Anglais) Consulate is shown on land beside Elles & Co's godowns and not up on the hill to the north. Foreign traders having already established firms and godowns on the north shore of the harbour at Shao-chuan-tou, in September 1864 Swinhoe leased an old ship named "S S Clover" and renovated the ship to be the British Deputy Consulate at Takao. By 1865 Swinhoe had been promoted to Consul and was residing aboard the old Dutch frigate 'Ternate' with his young wife, Christina (nee Stronach), whom he had married in 1862 and who gave birth to one of his children in Takao. This ship, or hulk, was an opium receiving ship for Dent & Co, where the company stored the opium arriving on the clippers and transacted their business. The hulk was also the residence of William Pickering who was in the employ of the Imperial Maritime Customs. Whether by coincidence or design, the name of the hulk is shared by the small island of Ternate in the Moluccas, Indonesia, upon which Alfred Russel Wallace wrote his inspired essay on natural selection published in 1858. This paper is considered to be one of the foundations upon which Charles Darwin devised his 'Origin of the Species' which was published the following year in 1859. During his stay in Takao Swinhoe made frequent excursions onto Ape Hill where he observed macaques (see above), eagles and a "track of flying butterflies like a river flow". Swinhoe was not only an ornithologist (see 'Ornithology') but also a lepidopterist. One common butterfly on Ape Hill today is the elegant brown-and-white Chocolate Tiger, Parantica melaneus swinhoei, named by Frederic Moore in 1883 in honour of this pioneer in the study of Taiwan's flora and fauna. Notable mammals that Swinhoe discovered during his time on Taiwan include the Formosan Black Bear, the Formosan Clouded Leopard and the Formosan Sika Deer, as well as identification of the Formosa Salmon. Some of these creatures may have been examined in an annexe to the McPhail building (subsequently the British Consulate in 1867) in Takao. However, there is scant evidence to suggest that Swinhoe ever actually resided in this old British Consulate building that stands on the low hill of Shao-chuan-tou above the harbour entrance. Although the building dates back to 1865, it was originally built as the headquarters of McPhail & Co (Tien-li Company), then the premier trading company in the South China seas. However following the dramatic failure of McPhail & Co in Taiwan, an event tragi-comically described by Pickering, the British Government formally took over the superbly sited building in 1867. The consulate remained in the building until 1910 when the Japanese colonial government embarked on the development of Takao harbour and declared the surrounding area 'restricted'. It was subsequently to sold to the Japanese as a Port Authority residence. The building was restored in 1986. 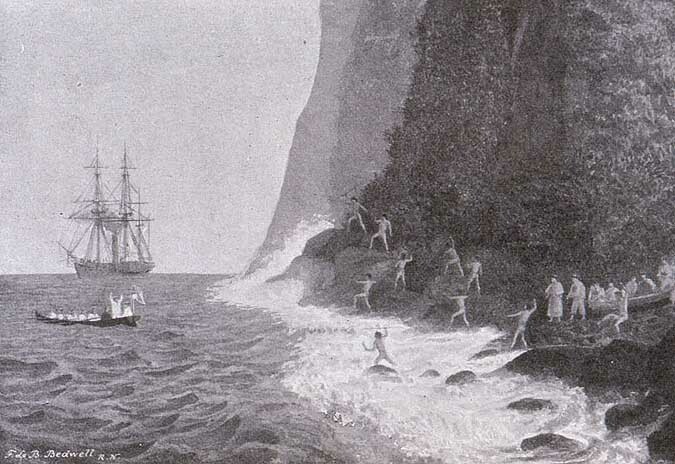 The engraving below, from an earlier sketch by Edmund Hornby Grimani, a Commissioner Of Maritime Customs who spent several months in Takao, hints at the excitement of exploration around the Kaohsiung Lagoon during Swinhoe's time. 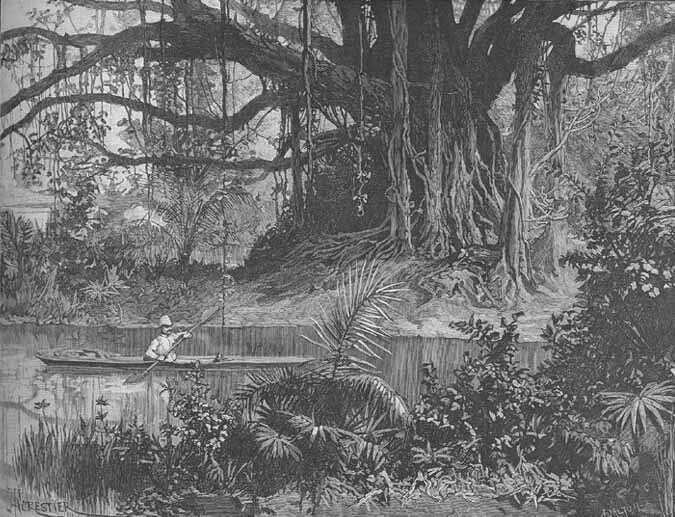 'Canoeing at Takow, Formosa'. An engraving from a sketch by E H Grimani in The illustrated London Times 1890. In February 1866 Swinhoe visited the mountainous district near Mount Sylvia (today's Hsueh Shan) to study deer, and this was to be his last exploratory expedition in Formosa. He was appointed HM Consul at Amoy in May 1866, making only a very brief visit to Takao, for which he remained responsible, in January 1869 after which he would leave the island forever. Following an 18-month period in London, during which he published many articles, he was appointed Acting-Consul at Ning-po in May 1871 and returned to China. Ning-po, a major cultural centre, was one of the first five treaty ports to be opened under the 1842 Treaty of Nanjing that ended the (first) Opium War. At this time Ning-po was an important trading centre for Celadon porcelain which was in great demand in Victorian England. Swinhoe, weakened by a probable stroke, was briefly assigned to Chefoo (Yantai, Shangdong Province) in 1873. However, in November 1873 Robert and Christina Swinhoe departed China forever from Shanghai to live in London. In 1876 he was elected Fellow of the Royal Society, an honour bestowed in recognition of his well-established expertise in zoology, thus joining others such as John Gould. On 28 October 1877 he died, aged only 41. As for Christina, more information can be found on the next page 'Ornithology'.